The Ping G20 Driver is available HERE at 2ndswing. Released in 2011, the Ping G20 quickly became one of the performing drivers and earned a spot on Golf Digest’ 2012 Gold Hot List. In fact, the G20 driver successfully lived up to solid reputation of Ping products. Players of all ability levels will benefit from the consistency and distance the G20 produces. PGA professional Matt Keller gives his insight on the Ping G20 Driver, and how it stacks up to Ping’s previous models. The Ping G20 is engineered from Ti8-1-1, a lighter and lower density alloy that allows Ping to position weight to create a higher MOI. The variable thickness in the club face creates faster speeds and increases MOI for more forgiveness. Additionally, the G20 design optimizes the COG for a high launch and low spin. While nearly every other manufacture created an adjustable club, Ping designed the G20 with a glued club head. The Ping 20 is a very successful line and the technology fused with the G20 driver rates 8 out of 10. The G20 line is simple and effective. The Ping G20 driver features a 460 cc club head with a more elongated and shallower face in comparison to the previous G15 driver. The dark gray club head uses a white crescent alignment aid, a big improvement and more a more visible alignment aid compared to the previous G15. The G20 sets up really nice and frames the ball at address. 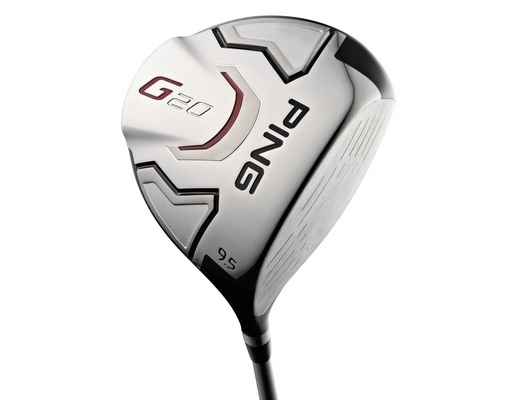 In my opinion, the Ping G20 is average in appearance, looks easy to hit and rates 8 out of 10. I tested the Ping G20 9.5 degree driver with a stiff TFC 169D stock shaft. The specs of the Ping G20 driver are nearly identical to the G15, including a D3 swing weight and 46 inch shaft. While the previous G15 and K15 deliver consistent results, the G20 will potentially outperform both models. The slightly shallower club face helped create straighter tee shots and perform well on off center hits. Impact creates a hard “crack” sound and feels great when you find the sweet spot, yet still provides a consistent feel and solid results everywhere on the club face. The G20 is above average in the distance department and generally produces a mid to high ball flight. Overall, I felt the G20 is longer and straighter than the previous G15 model. In addition, it is longer and produced less spin than the super easy to hit K15 driver, however, the G20 is not as straight as the K15. The G20 is a reliable and consistent performer that rates 9 out of 10 in performance. While many companies continually develop and release new products, Ping stands behind the quality of their product in two year cycles. The best way to describe the entire Ping G20 lineup is solid and dependable. Overall, the club looks average but performs great. The G20 was a top seller in the $299 price range, and should be a steal at a reduced cost of new or used G20 driver. The value of the Ping G20 driver rates 8 out of 10.